Class 4 Diode Gigaa Lasers for use in veterinary therapy, surgery and dentistry. Our units are capable of therapy only, diode laser surgery only, or for the most flexible option select a unit capable of both! 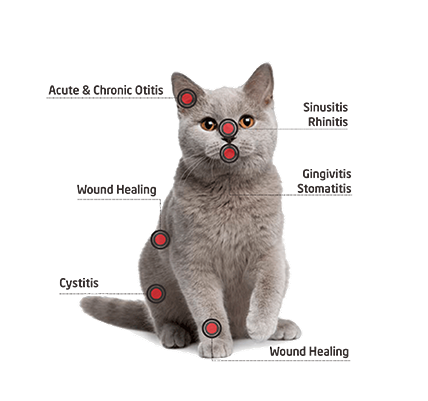 Whether it is for general vet practice, specialist veterinary centres, physiotherapy and rehabilitation specialists, or universities, we have a Diode laser for you. By easily changing hand pieces you will be able to perform therapy, surgery, dentistry, percutaneous intervertebral disc decompression, tooth whitening, and more. 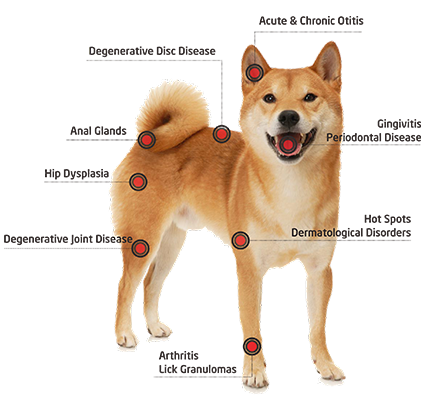 We recommend Class 4 Diode lasers running 810nm and or 980nm wavelengths with outputs between 6 watts and 15 watts power output as they will capably cover 99% of your general veterinary laser needs – therapeutic or surgical. However, if you have something special in mind we can also supply lasers with wavelengths of 532nm, 635nm, 670nm, 940nm, 1064nm, 1210nm, or 1470nm. Power outputs range up to 200 watts depending on the application. If the laser ray is not used point-exactly but defocused, it can be applied for laser irradiation as well. This has the advantage that the irradiation times can be shortened considerable and repetition treatments are necessary only after clearly longer time distances. This treatment has anti-inflammatory, analgesic and cure-promoting effects and can be therefore used for the treatment of healing of wound disturbances as well as for illnesses of the locomotorium (acute and chronic joint inflammations, musculature inflammations, sinew inflammations or tenosynovitises). Gigaa lasers work very well, are easy to use, are extremely versatile and are solid pieces of kit. 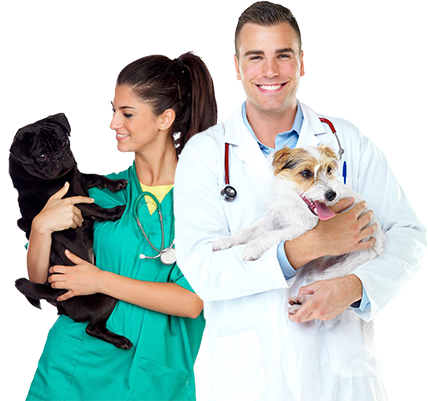 We will recommend a veterinary laser unit suited to your requirements, and it should pay for itself inside 12 months by generating new income streams for your practice. Owning my own practice and being an older guy, I am acutely skeptical of smoke and mirrors, but after a lot of research and first hand experience I know this technology and more specifically Gigaa Lasers work brilliantly and are the most economical choice available. Additionally Class IV therapy lasers allow you the professional satisfaction of improved clinical outcomes, along with happier pets and their owners. In the surgical area, the laser ray can be used for the cut of tissue like a scalpel. Through the high temperatures of up to 300 °C, the cells of the treated tissue pop open and evaporate. This process is called vaporization. The vaporization can be very well controlled through the selection of the parameters for laser performance, focussing of the laser ray, distance between the tissue and reaction time and therefore point-exactly applied. The strength of the used fiber-optic decides furthermore how fine the executed cut becomes. The influence of the laser causes a coagulation of the surrounding blood vessels so that the field remains freely from bleedings. After-bleeding in the cut area is avoided.